We arrived back in Pohang yesterday from a couple of weeks in the Laos People's Democratic Republic: Vientiane, Vang Vieng, Luang Prabang, Xam Neua and Vieng Xai. 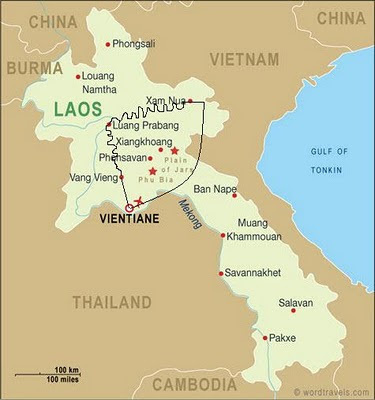 Though Laos is not a destination I would ever have immediately considered, had you asked me where I would choose to spend a two week vacation - primarily because it is landlocked, I suppose, and whenever "vacation" registers in my mind a beach isn't far behind - it was a very eye-opening, very unique, adventure. I'll be writing about the trip over the next couple of days, so check back for the pictures and stories. Unfortunately, on the way to catch our return flight, we realized that we misplaced one of our cameras, which contained 2gbs of photos and all of the videos we had taken. Bummer.